Protesters in the streets of Belgrade, Serbia, on December 29, 2018. Unknown author, widely shared on social networks. Mass protests against human rights violations by the government of Aleksandar Vučić have entered a fifth consecutive week, with thousands joining in from five Serbian cities beyond the capital Belgrade. Demonstrations began after Borko Stefanović, president of the political party Serbian Left and a founder of opposition coalition Alliance for Serbia, survived an assassination attempt on November 23, when thugs wielding metal bars beat him and two other Serbian Left party activists in the city of Kruševac in Central Serbia. Protests intensified following another assassination attempt against journalist  Milan Jovanović on December 11. Every Saturday since late November, thousands of people have braved sub-zero temperatures and taken to the streets of Belgrade under the slogan “stop bloodying shirts” (#STOPkrvavimkošuljama ). The slogan came about following a press conference in which Sefanović displayed his bloodied shirt at a rally following the November 23 attack. 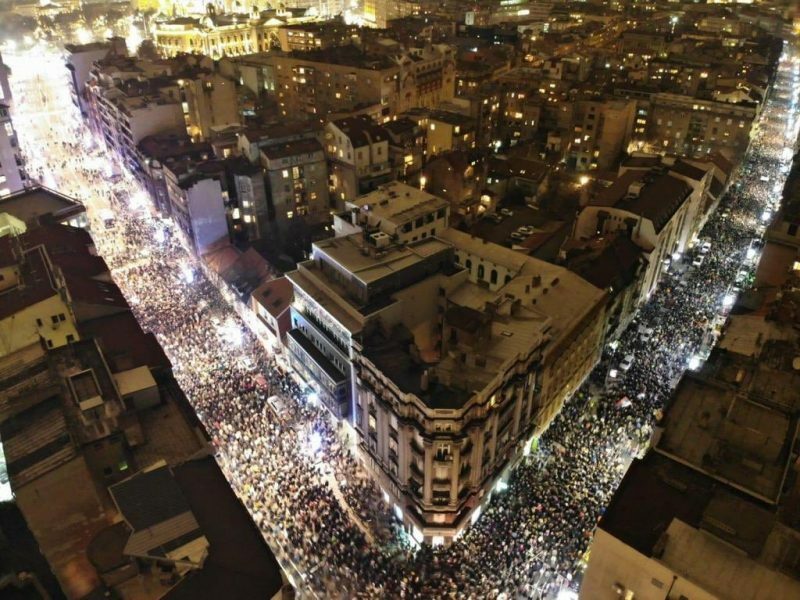 January 5 was the first time large demonstrations were held in Novi Sad, Niš, and Kragujevac, three major cities in Serbia, as well as in smaller Kuršumlija and Požega. Another protest slogan, “one in five million” (#1od5miliona ), refers to Vučić's recent declaration that he won't fulfill any demands even if five million people show up on the streets. Serbia has a population of around six million. Is this a laughing matter or something to cry about? 22 years ago I took my daughter to a protest against Milošević. Today, she came to Belgrade and took me to a protest against Vučić. Another slogan spotted both in the streets and on social media says “it has begun” (#počeloJe ), a cry of hope that the protests would grow into a country-wide movement similar to that of the late 1990s. So far, he has shrugged off the protests. While government-controlled media  has attempted to minimize their size and importance, Vučić himself has dared his opponents with talks of a snap election which near-total party control over state institutions and media would likely hand him victory. Opposition leaders have said they would boycott such a move. Speaking with Balkan Insight , protests’ organizers say their biggest gain is to have “awakened the Serbian youth from apathy” while not directly campaigning for the opposition as a replacement for the current government. The opposition has been markedly low-key in the protests for fear of alienating party-neutral citizens or civil society activists. Meanwhile, the public has ridiculed official attempts at disinformation . With internet access, people can see what is happening for themselves through live videos and photos taken on site. Tweet: Yesterday the column was lead by health workers who don't want to take intensive German language course and spend the next Christmas far away from here. They want to remain here because Serbia is their and our country. Video: See you at the Plato on January 12. And in an open letter addressed to Vučić , protesters say his smear campaigns won't intimidate them. You received a mandate to be a president of all citizens, not [to use that position] for showdown will all who dare to think with their own heads. You want subjects, not citizens. Therefore you now have columns of people who don't want to live in such a society of your creation.